While looking for a replacement of my second handset, I narrowed my search down to the Galaxy series and I am particularly looking for one that is in the mid-range. My main cellphone is an Apple iPhone, so, it is ideal - at least for me - to go to Samsung for a complementary set. Galaxy S4 Mini has just been released this month and it is too early to tell if the street price would be in the range of RM1,299 to RM1,399. Recommended retail price (RRP) is RM1,599. Anyway, this has been included in the Table purely as a bench-marker for the mid-rangers. The Galaxy S4 Mini is the toned-down version of Samsung's latest flagship, the Galaxy S4. On my radar are the Galaxy S3 mini (a bit dated now), Galaxy Grand, and Galaxy Win (also sold as dual-SIM Galaxy Quattro) - all in the price range of RM999 - RM1,099. I checked few outlets out and found that there is another great contender, a Non-Samsung-Waranty unit (not by Samsung Malaysia) called Samsung Galaxy Express. Released quite recently in March 2013, I compared that, specifications-wise, it is pretty impressive. I would say it beats both the Galaxy Grand (I9082) and Galaxy Win/Quattro (I8550) as well as the Galaxy S3 mini, by a small margin. The Galaxy Express is equipped with 4G LTE and Super AMOLED plus, 4.5" display. At City Mall in Kota Kinabalu, the Galaxy Express is retailed at RM999. Problem is that, in Malaysia it is not listed in the Samsung Warranty list (it is on AP Warranty) and to me this is a deal breaker. The retailer told me that the camera and display are covered with only 3 months of warranty. Being an AP set, the labour charges per visit/check is RM100, plus RM400 for faulty display and RM100 for faulty camera. I gave it a pass and choosed Samsung Galaxy Win/Quattro (I8552) instead. It was released in May 2013 and I paid RM999 for it. I will need some getting used to with this one. The set is covered by Samsung warranty and I should be in good hands for the next 1 year. First impression: It's a bit big with 4.7" display compared to my main handset, the 3.5" iPhone 4S. Nothing near the iPhone in terms of performance, speed and user experience but good enough as a second handphone set. It will be slotted with Celcom SIM to complement the Maxis Surfmore75 on my iPhone. Verdict: If one asks me which of the four similarly priced mid-range Galaxy phone would I choose, I'd say Galaxy Express, followed by Galaxy Win (also known as Galaxy Grand Quattro). 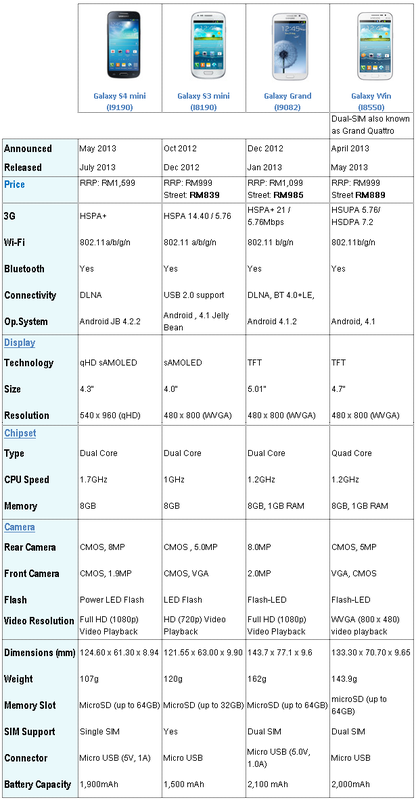 Figure 1: Comparison table - all of them comparable, except for the higher priced S4 Mini. First impression is that, the latest offering (Galaxy Win/Quattro) is exciting as new releases would normally offer some features that belong to the current higher-end version. I called up few local retailers and the prices are still negotiable if you go there in person. My hunting will begin this weekend. The Galaxy Grand looks tempting but the S3 Mini might win it in terms of overall features. We shall see. Please stay tuned, this page will be updated in due course. The retailer at City Mall insists that their Galaxy Express waranty is from Samsung.